It is delusional to expect that this unfettered racism will stop there. It must be confronted. Shockingly, though, most ‘indigenous’ ethnic organizations are silent on the ongoing crisis. Tortured Rohingyas escaping from Myanmar in Palongkhali, Ukhiya,Cox's Bazar, Bangladesh, February 2018. Flickr/ maruf1122345. Some rights reserved.This is one of the closing articles in the series on ‘confronting authoritarian populism and the rural world’, linked to the Emancipatory Rural Politics Initiative (ERPI). The article opening the series can be read here. At the same time as a democratic system is being revived in Myanmar after half-a-century of military dictatorship, strong challenges have re-emerged. A racist, authoritarian populism is being directed against Muslim minorities, notably the Rohingya, in order to prop up a regime that has no vision. This is threatening not only the administration and the economy, but also more importantly, social and ethnic cohesion. While admitting that these challenges would tax any government and state, the weaknesses and inadequacies at the core have been revealed. Ideologically, a half-hearted attempt at socialism going by the name of “The Burmese Way to Socialism” under a military-controlled one-party state, came unstuck when this was unseated by a bloody public uprising in 1988. Re-instated military junta rule lasted till 2010. The leading pro-democracy party, the National League for Democracy (NLD), contested the by-elections of April 2012, won most of the seats, and entered parliament. This victory was repeated and enlarged in November 2015, with the result that a democratically-elected civilian government has been installed. After five decades of junta or one-party rule, there is now a multi-party system. However, two-thirds of the 93 parties registered are ethnic-based parties, and almost exclusively single-ethnic. Twenty three political parties won seats in the bicameral parliament, but the picture is dominated by just two parties – the military-linked Union Solidarity and Development Party and the NLD. With ideological decline, rudimentary election campaign platforms and minimal policy contestation, the stage was set for a recourse to populism. Besides the Myanmar public’s widespread rejection of the military government, populism played a large part in the NLD’s electoral successes. To fan this populism, or to deploy parallel ‘brands’ of it, use was made of what has been called ‘nationalism’. To fan this populism, or to deploy parallel ‘brands’ of it, use was made of what has been called ‘nationalism’. Nationalism may be too polite a term, though, since this nationalist-populist impetus came from inciting latent racist phobias and demonizing the ‘Other’. The brunt of this wave of discrimination and violence fell upon a vulnerable ‘foreign’ community – the Muslims, and particularly the Muslim Rohingya. 2017 saw the most extreme and brutal manifestation of this: a horrific campaign that the UN has described as amounting to genocide. At independence, Myanmar started off a little unsure of itself ideologically, while threatened by a far-left armed rebellion. With the collapse of the left in 1989, the swerve in the opposite direction began. Since then, the political left has virtually disappeared. Now the poor, the old, minorities and the marginalized have been abandoned politically. In the 2015 elections the electorate came out with an emphatic statement to bring down the curtain on the military dictatorship, propelling the NLD to power. Despite reservations (shared by myself for instance), there was some hope that things could be worked out. The two years that followed was an ebullient time for Myanmar internationally. The rosiness of the ambience managed to hide many of the missteps that were being made. Yet, what were once seen as Aung San Su Kyi’s strengths soon became weaknesses, and at the same time once-hidden weaknesses emerged with a vengeance. Both the Myanmar military and the NLD government are scrambling to garner as much public support as they can. But, at the same time, there is a move to the right, facilitated by an entrenched military, big business with tentacles everywhere, ethnic assertiveness, and the resurgence of militant religion. In the absence of any political ideology, Myanmar’s rulers are falling back upon primitivism, populism and authoritarianism. Democracy in Myanmar did not begin in 2010. Limited democracy had been enjoyed since the late 1930s; quite early for Asia. The majority of the people are therefore no strangers to a democratic system – at least of the electoral variety. Despite the Myanmar public’s longing for the resumption of a democratic system, a majoritarian democracy will not be a cure-all for what afflicts them. Instead, a genuinely plural system that presages a plural nation has to be the goal. Contrary to most popular assumptions, a nation shall not ensue with the re-advent of democracy. A genuinely plural system that presages a plural nation has to be the goal. Contrary to most popular assumptions, a nation shall not ensue with the re-advent of democracy. Domestically, both the ruling NLD government and the military have tasted the flavour of increased public support. What really counts for them is not the racist overtones but the votes that it can bring in the next elections. Myanmar’s ethnic diversity sits uneasily with a Bamar Buddhist majority that is increasingly chauvinistic and intolerant. With an antiquated first-past-the-post electoral system, the politicians and generals know very well that if you have the ethnic and religious majority sewn up, you don’t have to bother much about the minorities. But with Myanmar’s history of a 70-year civil armed conflict, electoral victories do not ensure the return of peace. Relying upon majoritarian politics and mono-ethnic nationalism can actively deter a peace settlement with the ethnic nationalities, and by extension, the hoped-for federal system. 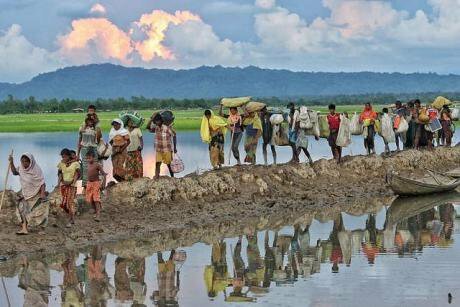 The current hard-edged racism is now directed against the helpless Rohingya and against Muslims in general. At a recent workshop I participated in, non-Buddhists (mostly young) articulated the discrimination, exclusion, differentiation and denial that they are experiencing. This is in education, employment, residence, travel, and even in the size of bribes demanded. But it is delusional to expect that this unfettered racism will stop there. It must be confronted. Shockingly, though, most ‘indigenous’ ethnic organizations are silent on the ongoing crisis. This is an era of electoral politics, with an electorate emerging from decades of dictatorship. Authoritarian populism holds sway. Beyond garnering votes, parties and politicians have little regard for public opinion. There seems to be little thought as to the direction in which the country is going, or needs to go. Civil society is not strong or big enough; it is divided and mostly involved in niche issues. The crony private sector is flourishing and going from strength to strength, keeping to its rentier, extractivist and exclusivist ways. On top of it all, all these stakeholders are isolated and inward-looking. One donor has asked how a democracy can be built if people do not talk to each other. Myanmar seems to be losing its way. After expending much time and suffering, a semi-democracy has been gained. But beyond this, there is neither road nor chart. One donor has asked how a democracy can be built if people do not talk to each other. Myanmar is being subjected to forces and influences quite unlike the past, and change, whether willing or unwilling, is going to be the order of the day. With an incompetent state and leaders without vision, pursuing their paltry little ends, Myanmar has little chance of standing up to the winds of change. The out-dated nationalism, which is found so useful now, is generating tension, division and violence. For the future, only a diverse and resilient national identity can hold its ground.